The early 2000s mark the best years for Toyota Motor company. 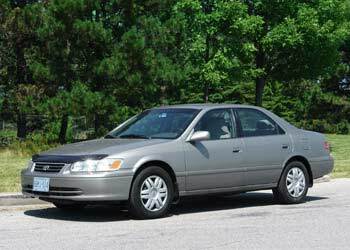 Many experts agree that the 1997-2001 Camry is one of the most reliable cars ever built. 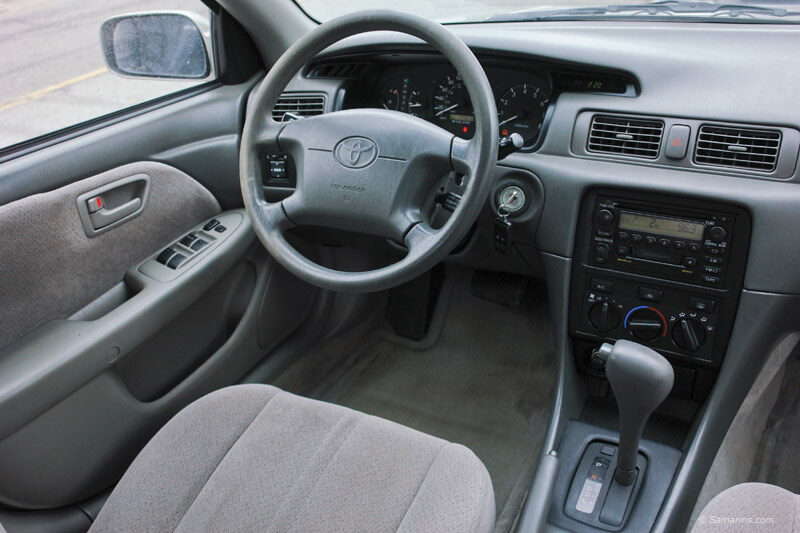 It offers a comfortable interior and soft, quiet ride. It comes as a four-door sedan or two-door coupe (Camry Solara). The interior is roomy, with soft seats and easy-to-use controls. There is plenty of head- and legroom for front and rear passengers. The trunk is large and the rear seat backs fold down for more cargo space. The Camry has front-wheel drive and comes with a 4-cylinder or V6 engine and a 5-speed manual or 4-speed automatic transmission. Maintenance and repair costs are low. The 4-cylinder Camry is rated among the best in its class for fuel economy. 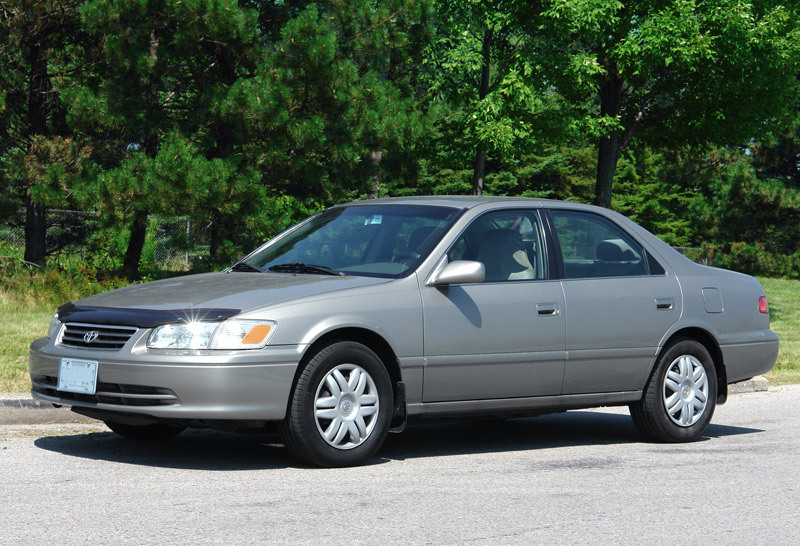 The Camry is very reliable and with good care can easily last for 250,000 miles and more. Common problems are mostly minor, read more below. 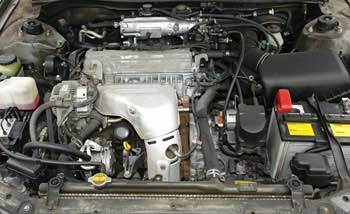 Toyota Camry 2.2-liter 5S-FE engine. Powertrain: The base 136-hp 2.2-liter 4-cylinder DOHC engine is fairly quiet and easy to maintain. The optional 194-hp 3.0-liter V6 is smooth and offers plenty of power. 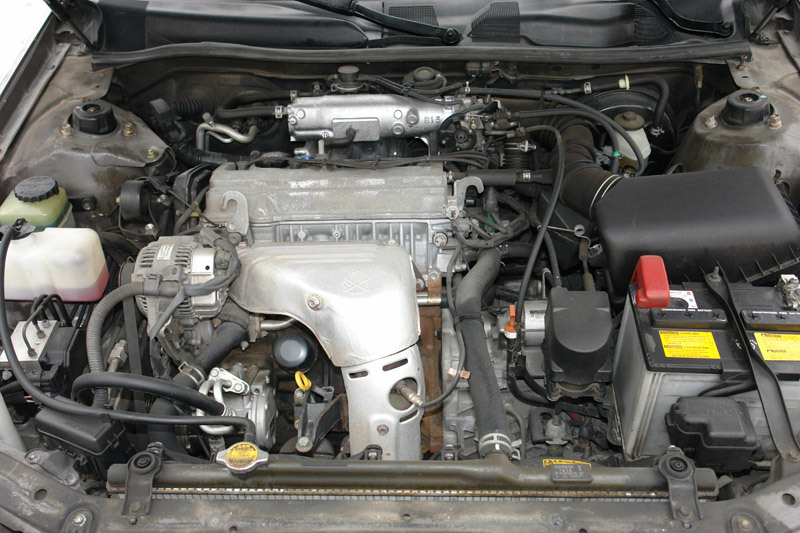 Both engines have a timing belt (for 2000 and 2001 Camry, Toyota recommends replacing the timing belt every 90,000 miles). Both are very good reliable engines; with good maintenance you shouldn't have too many problems with either one. Fuel Economy: The EPA rates the 2000 Camry with a 4-cylinder engine and an automatic transmission at 20/28 mpg or 11.8/8.4 L/100 km city/highway, which means you can travel approximately 382 miles (614 km) on one 18.5-gallon (70 liter) tank with a mix of 55 percent city and 45 percent highway use. The estimated annual fuel cost: $2,450. RELATED: 2007-2011 Toyota Camry review: reliability, common problems, maintenance and more. Handling and ride: The Camry has a soft and quiet ride. The steering is light, without much feedback. The soft suspension absorbs road bumps and expansion joints well, but some body lean is noticeable when cornering. Overall, the handling is secure and comfortable, although not sporty. Safety: Antilock brakes are standard in all, but the base models. In the NHTSA frontal crash tests, the 1997 Toyota Camry received four stars for both the driver and the front passenger; the improved 1998-2001 Camry received four stars for the driver and five stars for the front passenger. Pros: Reliability, fuel economy (4-cylinder models), soft and quiet ride, comfortable interior, easy to maintain, easy to sell. Cons: Plain interior styling, body roll in turns, steering wheel wears fast, both engines have a timing belt that must be replaced at recommended intervals. What to look for when buying a used Toyota Camry: Check the used car history records to find out about previous reported accidents and other problems. When test driving the car, if you notice blue smoke from the exhaust, even if it's just a small cloud at a start up, avoid the car. Watch out for oil leaks. A knocking noise from the suspension on bumpy road may indicate bad suspension components (bad front strut mounts were common). Check for signs of sludge under the oil filler cap with the engine off. If the "Check Engine" light is on, have it checked before buying a car; some problems are expensive to repair. Read more tips: illustrated used car checklist. When deciding between two cars, it's worth to pay a little extra for a one-owner well-maintained car in good shape. Before buying, have the car inspected. Toyota Camry common problems: A bad vacuum switching valve (VSV) for EGR located under the intake manifold could cause the trouble code P0401 in a 4-cylinder engine. Other things need to be checked, but often, a new VSV valve fixes the problem. A bad catalytic converter can cause the code P0420; the catalytic converter is expensive. A faulty starter solenoid can cause a no-start condition where the starter would click but would not crank. Broken wires in the trunk lid wiring harness near the driver's side hinge could cause various electric problems, including various warning lights, taillights and reverse light issues. Wires typically break where the harness flexes from opening and closing the trunk lid. A dirty idle air control (IAC) valve in the throttle body can cause stalling and rough idle. Cleaning the IAC valve can help, if there are no other issues. The trouble code P0446 could be caused by a bad EVAP vacuum switching valve (VSV). The repair often involves replacing the EVAP vacuum switching valve (VSV) and the charcoal canister as an assembly, but if you want to save money, try replacing just the EVAP VSV and cleaning all the vacuum hoses at the canister; sometimes it may be enough to fix the problem. Bad strut mounts could cause a knocking or rattling noise in the front suspension. Bad stabilizer bar bushings/links can also cause similar noises. If you hear a knocking noise coming from the front suspension, have it checked out, as the car might be unsafe to drive. If the cabin heater fan works only at the high speed position, the heater fan resistor is the first part to check. Usually either the connector or the resistor itself gets corroded, causing this problem. The heater fan resistor is not a very expensive part and is fairly easy to replace. Maintenance tips: To keep your engine in a good shape, have the oil changes done at regular intervals. High-mileage cars need even more frequent oil changes; we recommend doing oil changes every 3,000-3,750 miles. Overheating may cause serious problems; to avoid overheating, keep the engine coolant topped up and timely repair coolant leaks. Change automatic transmission fluid whenever it becomes dirty. A PCV valve also needs to be regularly inspected and cleaned or replaced if needed. A clogged PCV valve can cause increased sludge build-up inside the engine. For repairs, use original Toyota parts; they are not too expensive. If the brake pedal feels too low, the brakes need to be serviced. Have your car inspected, at least once a year, in a garage on the lift to keep it safe. 2.2L, 4-cyl engine, 5-speed Manual trans. 2.2L, 4-cyl engine, Automatic trans. 3.0L, V6 engine, 5-speed Manual trans. 3.0L, V6 engine, Automatic trans.